Its main venue, the opera house (Opernhaus Nürnberg), is one of the largest theatres in German. It was built from 1903 to 1905 in Art Nouveau style by the architect Heinrich Seeling. 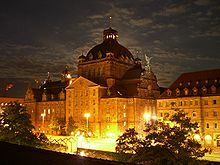 Other venues are the play house (Schauspielhaus Nürnberg) including the small stages Kammerspiele and BlueBox, and the Meistersingerhalle where the concerts of the orchestra (the Staatsphilharmonie Nürnberg) are held. Since 2018, the company's Generalmusikdirektorin (General Music Director) is Joana Mallwitz. Her initial contract, announced in October 2017, is for 5 years. She is the first female conductor to be named GMD of the company. ^ "Joana Mallwitz ab 2018/2019 GMD am Staatstheater Nurnberg - Zum ersten Mal wird eine Frau Orchesterchefin in Nürnberg" (Press release). Staatstheater Nurnberg. 24 October 2017. Retrieved 2017-11-01. ^ Wolfgang Schicker (2017-10-24). "Neubesetzung am Staatstheater Nürnberg: Joana Mallwitz wird Generalmusikdirektorin". BR-Klassik. Retrieved 2017-11-01. Wikimedia Commons has media related to Staatstheater Nürnberg. This article about a theatre building in Germany is a stub. You can help Wikipedia by expanding it. This page was last edited on 25 February 2019, at 17:00 (UTC).